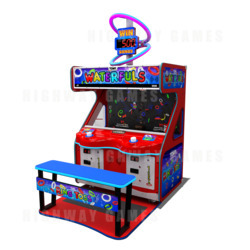 Waterfuls is a ticket redemption game where players must pump the button in order to launch the rings through the "water" and onto the two backlit pegs. The more points to players score, the more tickets they win as they play to achieve the bonus. The technology combines a virtual field of play with real-world objects to deliver a 3D gaming experience. The new technology along with the pressure-based pump button helps to replicate the iconic 80's game, while still being fun for first time players.